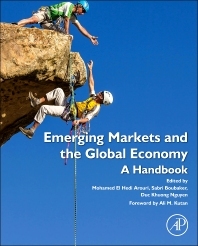 Emerging Markets and the Global Economy investigates analytical techniques suited to emerging market economies, which are typically prone to policy shocks. Despite the large body of emerging market finance literature, their underlying dynamics and interactions with other economies remain challenging and mysterious because standard financial models measure them imprecisely. Describing the linkages between emerging and developed markets, this collection systematically explores several crucial issues in asset valuation and risk management. Contributors present new theoretical constructions and empirical methods for handling cross-country volatility and sudden regime shifts. Usually attractive for investors because of the superior growth they can deliver, emerging markets can have a low correlation with developed markets. This collection advances your knowledge about their inherent characteristics. Chapter 11. Developed and Emerging Equity Market Tail Risk: Is it Constant? Professor of Finance at the University of Auvergne. Professor of Finance and Deputy Director for Research at IPAG Business School (France).